- First of all I would like to congratulate everybody on the Kazakhstan Independence Day! Today, we presented 28 riders who will perform in the Astana colors in the new season. I think, that we managed to gather a well-balanced team, which combined experience and youth, specialists in various cycling disciplines. We have seriously strengthened some positions, which next year will allow us to fight for victories in the Grand Tours, prestigious stage races as well as in classics races. Last year was very successful for our team – our riders won 33 races and took 62 podium places. For two times, Miguel Angel Lopez stepped upon the podium of two Grand Tours, at the Giro d’Italia and the Vuelta a España. The goal for the new season is to be at least as successful as last year and try to overpass the results. I think that's realistic. Among the main objectives are the Grand tours and the WorldTour stage races, - said Alexandr Vinokurov at the end of the presentation. 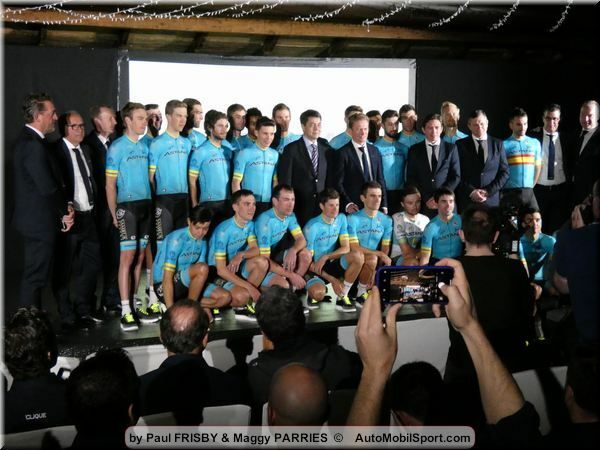 Nine newcomers of Astana Pro Team in the season of 2019 were introduced at the official presentation: Yuriy Natarov (Kazakhstan), Ion Izagirre (Spain), Gorka Izagirre (Spain), Davide Ballerini (Italy), Manuele Boaro (Italy), Merhawi Kudus (Eritrea), Jonas Wilsly (Denmark), Rodrigo Contreras (Colombia) and Hernando Bohorquez (Colombia). Davide Ballerini (Italy), Pello Bilbao (Spain), Zhandos Bizhigitov (Kazakhstan), Hernando Bohorquez (Colombia), Dario Cataldo (Italy), Rodrigo Contreras (Colombia), Magnus Cort Nielsen (Denmark), Laurens De Vreese (Belgium), Daniil Fominykh (Kazakhstan), Omar Fraile (Spain), Jakob Fuglsang (Denmark), Yevgeniy Gidich (Kazakhstan), Jonas Wilsly (Denmark), Dmitriy Gruzdev (Kazakhstan), Jan Hirt (Czech Republic), Hugo Houle (Canada), Ion Izagirre (Spain), Gorka Izagirre (Spain), Merhawi Kudus (Eritrea), Miguel Ángel López (Colombia), Alexey Lutsenko (Kazakhstan), Yuriy Natarov (Kazakhstan), Luis Leon Sanchez (Spain), Nikita Stalnov (Kazakhstan), Davide Villella (Italy), Artyom Zakharov (Kazakhstan) and Andrey Zeits (Kazakhstan). At the races the team will be managed by sports directors Dmitriy Fofonov (sports manager), Alexandr Shefer, Dmitri Sedoun, Stefano Zanini, Lars Michaelsen, Sergey Yakovlev, Assan Bazayev, Bruno Cenghialta and Giuseppe Martinelli.